Blast the Bloats and Binges with These Tips. Bloating and heartburn after holiday meals takes the fun out of festivities. Sometimes these are caused by binging from mindless eating or emotional triggers. You can be so caught up in conversations during the office holiday party and before you know it, you’ve consumed far too may cocktail sausages! #1 First, pay attention to every piece of food and every glass that crosses your field of vision. Being mindful is key. When in doubt, ask yourself “do I really need this?” and “Did this make me miserable last time I ingested it?” A repeat offense on the food selection is not worth the misery later that night. #2 One of the keys to food tolerance is having a healthy gut and strong digestion. If you’re not taking any digestive enzymes on a regular basis, this is the time to start. Bloating, constipation, flatulence, food allergies or sensitivities are signs of digestive enzyme deficiency. A comprehensive enzyme, especially one containing, HCl or hydrochloric acid will maintain a more acidic environment in your stomach to help you break down the food and proteins you eat and prevent them from fermenting there. (This fermentation is a cause of acid reflux). If you are not sure which enzymes to take, check with your physician. #3 Eat at regular intervals throughout the day, at least five small meals. This keeps your blood sugar from yo-yo’ing. Don’t skip lunch because you’re going to have a six-course dinner tonight. A long gap time from your last meal may lead to poor food choices at the party or not being able to say no to the sugar and refined foods. Not to mention the overindulgence leads to evening sluggishness. #5 Choose your weapon carefully: Certain alcohols contain higher levels of gut irritants like fructose and gluten. These include beer (gluten) and fructose laden sweet spirits such as rum, dessert and sparkling wines, ciders and drinks mixed with sugary pop and juices. Cream liquers contain a gut-attacking combo of sugar and dairy. Go for the spirits combined with non-sweet mixers, dry white wines, lower alcohol reds and gluten-free beers. (Just be mindful of the calorie and sugar content). #6 Watch out for spicy or heating foods. Well, we all know what spicy foods are but what about heating foods? Anything that tastes pungent, salty or sour create heat in the body. In Ayurveda, certain foods increase the heat in the body (particularly the stomach) making a situation worse- particularly if you have a history of excessive burping or reflux. 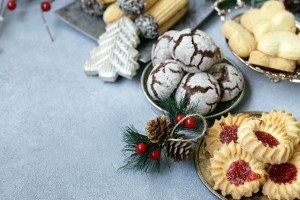 Heating foods you are likely to find at the holiday events include: hard cheeses, eggplant, corn, nuts, peppers, onions, tomatoes, sour fruits, beef, turkey, dark chicken meat and oohhh (yes I need to say it).. coffee, black tea and chocolate! #7 Try a cooling herb and make it a daily supplement. I’ve written and posted about my favorite “go to” herb which I use for detox, digestion, fat burning and a headache prevention. 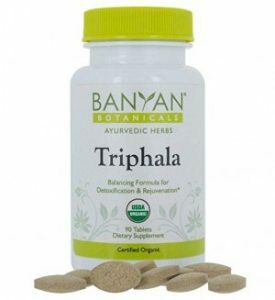 Triphala taken on an empty stomach with warm water every morning supports the removal of mucous and toxins from the intestinal wall, healthy elimination and tones the muscular wall of the gut. It’s made of three fruits from India – haritaki, amalaka and bibhitaki. Read the details here. #8 For Cravings? Get in a workout on the day of the party. I know when I come home from a good run or circuit training at the gym, I’m not feeling the need to reach for crunchy, salty or sweet snacks. In fact, I hardly notice them! Dehydration can lead to cravings. Drink a glass of water right before you reach for the brownies, wait a couple of minutes and see what happens. #9 Afraid you will Overindulge? Are you currently on a diet program and worried you may blow it? Drink a protein shake before you leave the house. I do this, especially if I am heading to an event where gluten free options are scarce to non-existent. My patients notice a big difference our refreshing neurotransmitter drink, RelaxMax. It crosses the blood brain barrier, keeps anxiety down and stabilizes blood sugar. You can pour it on the rocks or in a martini glass and kick back after a long day or take it before you head out the door or into a potentially stressful event. A quality protein shake, free of artificial sweeteners also stabilizes your blood sugar so insulin surges don’t cause any salty or sweet binges. #10 For the Bloats? Take a daily probiotic (preferably dairy free) and take it 30 minutes before the meal or during the meal. Why? Because it will be buffered by the food during its passage through the digestive tract and not corroded by the acidic stomach. I pop one before I leave the house. Also, if this isn’t currently part of your regular diet, start a regular consumption of prebiotics at least two days prior to holiday festivities. Prebiotics are the foods the probiotics need to thrive! This includes whole plant foods: dandelion greens, seaweed, apples, flaxseed (add this to your protein shake) and jicama. 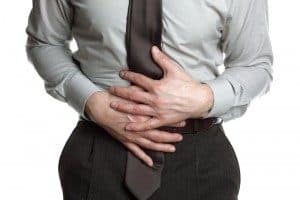 If you have ongoing digestive issues or autoimmune disease it is important to get evaluated to uncover the root causes. These tips I listed above may help you get through the holidays without major issues. Eat well, but eat wise! Comment below or reply with questions. You are welcome to book a free discovery session over the phone, please contact me here. And please share this article with anyone who needs a little help with this very common issue! Wishing you happy, healthy, holiday indulgences! 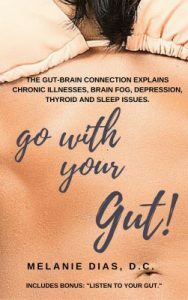 “Go with your Gut.” – eBook by Dr. Melanie Dias. Understanding the importance of gut health on the brain and its relationship to common health issues.